Tim Tebow could have made a stronger case for a Heisman repeat in 2008 had he the benefit of his 340-yard, two-TD performance in the BCS title game. Bowl games aren’t taken into account, with ballots due the Monday after conference championship games. It’s an archaic stance when you consider the NCAA began including stats from them in a player’s yearly total back in 2002 due to the vast number of postseason games. 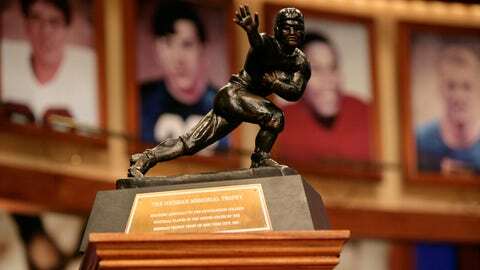 Here’s how seven Heisman races over the last 20 years could have changed it voting wasn’t completed until after the bowl games. Eddie George edged Tommie Frazier by 264 points to win, largely behind his Heisman moment of 314 yards against Illinois. But it would have been hard to argue with the player that finished behind him had we waited. While George ran for 101 yards and a touchdown on 25 carries in the Citrus Bowl, he also fumbled as Ohio State fell 20-14. Meanwhile, Frazier ran for 199 yards and had TD runs of 35 and 75 yards — the ladder, would have bee his Heisman moment as he shed seven tacklers — also threw for 105 yards and a score as Nebraska beat No. 2 Florida 62-24 to win the national title. Had bowl stats counted, George would have been the sixth player in history to go over 2,000 yards rushing, which certainly have resonated with voters. But it’s hard to argue that Frazier ended with a performance that was Heisman-worthy. It’s not that Heupel was that better than Weinke, he was 25 of 39 for 214 yards and a pick in Oklahoma’s 13-2 win, while Weinke threw two interceptions — including one in the end zone with 16 seconds remaining — to go with 274 yards (25 of 51) and a fumble. But it was Weinke’s first game that season without a TD pass and he had his lowest completion percentage at 49.0. Weinke’s stats may have still won out, but a shaky performance in the biggest game of the year would likely have tipped things in an already tight race in favor of Heupel, who led the Sooners to a 13-0 season. In the sixth-closes race in history, Crouch edged Grossman by 62 points, while Dorsey was just 132 behind in third. A post-bowls voting could have created a similarly tough decision for pollsters, though not with Crouch on top. The winner ran for 114 yards on 25 carries and was 5-for-15 for 62 yards and a pick-six in the BCS title game, where he was upstaged by Dorsey, who threw for 362 yards and three scores in Miami’s 37-14 win. Meanwhile, Grossman pass for 248 yards and four TDs in 56-23 rout of Maryland in the Orange Bowl, a game he didn’t enter until the 6:03 mark in the second quarter for missing curfew, (which makes you wonder if Steve Spurrier would have done so if a Heisman was on the line?). A Grossman-Dorsey debate would have been an intriguing one after their dominant bowl performances, but that Dorsey’s came in delivering a title, he gets the make-believe nod. Manning may seem like a stretch considering it was Fitzgerald that was 128 points behind White, while the Ole Miss QB managed just 95 of the 1,245 first-place votes. But after the bowls, Manning could have won by a process of elimination. All Manning did was pass for 259 yards (22 of 31) with two TDs and he ran for scores to beat Oklahoma State 31-28 in the Cotton Bowl. It was the Rebels’ first bowl win since the 1970 Sugar Bowl, a game in which Eli’s dad, Archie, starred. Don’ think that synergy wouldn’t have been a narrative all its own. Bush, who claimed 91.7 percent of the total points and 784 of the 892 first-place votes, was at his all-purpose best in the BCS title game against Young and the Longhorns. He totaled 279 yards, 82 rushing and a TD, 95 receiving and 102 on kick returns, but while he was great, Young was simply captivating. Young had 267 yards passing and 200 yards rushing with three TDs, highlighted by the game-winner with 19 seconds left, producing arguably the greatest BCS title game performance. Remember, the Buckeyes were a seven-point favorite in that game and were held to a paltry 82 yards of offense. The thought of still giving Smith the Heisman after that would have been a stretch. But if not Smith, who would have won? Darren McFadden was a two-time runner-up, though he may have claimed a Heisman after 2006 winner Troy Smith’s BCS title-game woes.